According to the Israeli Prison Service (IPS), as of 31 October 2018 there were 5,426 Palestinians (West Bank, East Jerusalem, Gaza) held as “security prisoners” in Israeli detention facilities including 220 children (12-17 years). In the case of children there was a 4% decrease in the number compared with the previous month and an annual decrease of 9% compared with 2017. These figures include 4 children held in administrative detention. According to the IPS, 60% of child detainees were unlawfully transferred and/or detained inside Israel in violation of Article 76 of the Fourth Geneva Convention during the month. Child detention rates are currently up 42% since UNICEF published its child detention report in 2013. It is relevant to note that according to the IPS, 60% of Palestinian child detainees are currently held in prisons located in Israel following their transfer out of occupied territory. This policy of transfer has continued uninterrupted since 1967. In 2015, MCW wrote to a number of diplomatic missions in Israel/Palestine seeking clarification of each State's position regarding Israel's policy of forcibly transferring Palestinian children from the West Bank to prisons in Israel in violation of the Fourth Geneva Convention and the Rome Statute of the International Criminal Court (ICC). As recently noted by the Prosecutor of the ICC, population transfers in an occupied territory constitute war crimes under international law. According to the most recent data issued by the Israeli Prison Service, at the end of October 2018, 132 Palestinian children were forcibly transferred and unlawfully detained inside Israel. So far responses have been received from: US, Norway, Canada, Australia, Netherlands and the EU. MCW is still awaiting responses from, inter alia, the UK, Germany, France, Sweden, Denmark and Ireland. 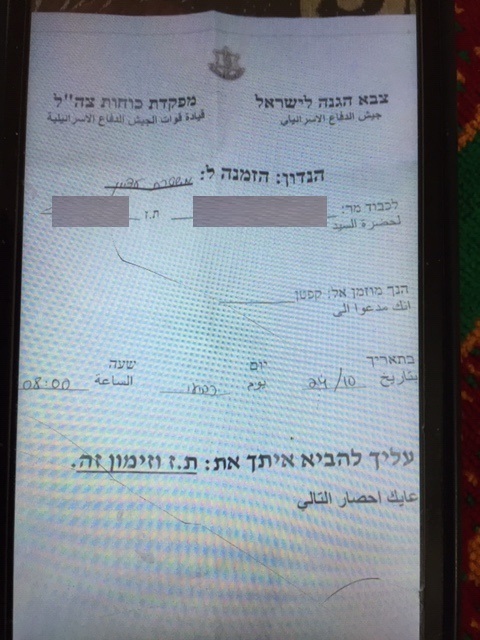 On 24 October 2018, the family of a 14-year-old boy from Al Arrub refugee camp is given a summons at 3:00 a.m. In accordance with the summons the boy goes to Etzion settlement for interrogation. "Our neighbours called my father at around 3:00 a.m. to tell us that Israeli soldiers were in the area looking for our house. Then soldiers came to my uncle’s house downstairs but could not find the entrance to our house and left. Then my father’s cousin phoned to say the soldiers were at his house and had delivered a summons for me to go to the police station in the morning. I was scared and could not go back to sleep. Later that morning my father’s cousin gave us the summons which was written in Hebrew." The Knesset Interior Committee advanced a bill on Sunday that provides for the early release of certain prisoners to reduce prison overcrowding, in response to a High Court of Justice ruling on the issue. The approved version excludes security prisoners – those who were convicted in military courts in the territories or for security offenses. The bill now goes to the Knesset for its second and third readings. The bill was reworded after Haaretz reported that the previous version provided for the release of 300 security prisoners a few months before their sentences were to end. The bill tries to resolve the overcrowding in Israel’s prisons, after the High Court ruled that each prisoner must have at least three square meters of living space. The Australian Friends of Palestine Association (AFOPA) has long supported the work of Military Court Watch. Your donation ensures their important work can continue.